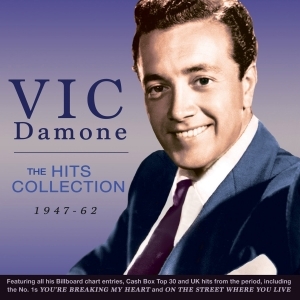 Vic Damone was one of the significant coterie of Italian American crooners to come to the fore in the post-war years to play a significant role in the popular music of the time – that group included the likes of Frank Sinatra, Perry Como, Dean Martin, Al Martino, Frankie Laine and Tony Bennett, so he was in illustrious company. Having got his break, like so many artists, on Arthur Godfreys’ Talent Scouts show, he signed with Mercury in 1947 and over the next fifteen years racked up around fifty hits in the Billboard, Cash Box and UK charts, scoring a US No. 1 in 1949 with “You’re Breaking My Heart” and a UK No. 1 in 1956 with “On The Street Where You Live” after he had moved to the Columbia label. This great value 50-track 2-CD set features 48 tracks which are listed as having made the charts, with many making the Top 10, including “I Have But One Heart”, “Again”, “My Heart Cries For You”, “Here In My Heart” and many more. It’s a great showcase for a talented and highly successful vocalist whose records captured the essence of the popular music of the times.